Table of contents – not only one, but three pages where one can list the content. Very good both for planning a journey and during the journey. Numbered pages. Very good when one is travelling. Then it’s easy to organize the journal without a lot of effort. I like to have one “diary” part and then sections over different places to jot down tips and such. Works very well with the table of contents. 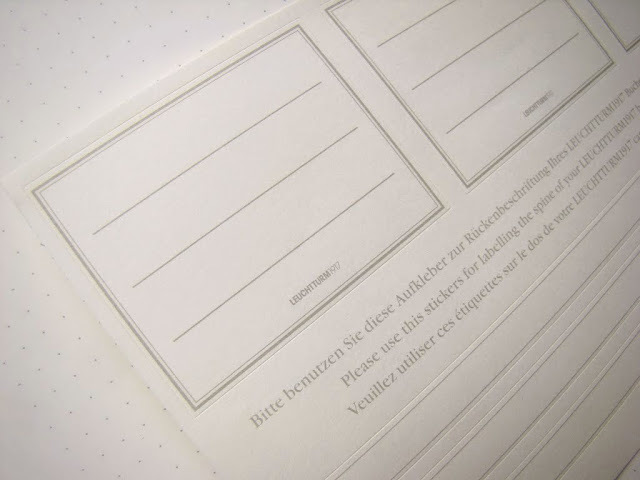 Perforated rip-out pages in the end of the notebook. Perfect during the journey. Stickers to put on the cover and spine if one wants to make it easy to catalogue different travel journals. A pen loop can easily be added which is very handy (especially with the featured Pilot M90) when one is travelling. They are bought separately and can easily be attached to the front or back. The paper quality doesn’t match the Habana, but during travels I will not use broad, wet pens much to jot down notes and it handles narrow nibs well. The smart little pen loop that can be added to the Leuchtturm. Nice dots and numbered pages. In all this is a notebook with some nice features that makes it special and very usable for those in need of organizing their notebook without spending time on customizing them themselves. 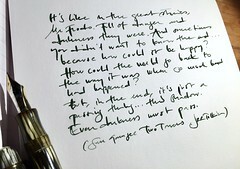 The paper is reasonably fountain pen friendly and tackles fine and medium nibs that doesn’t drool on the paper quite well. I still find it a nice acquaintance and a complement to the beloved Habana. …and the postcards is from my late grandmother’s stash of postcards which I am happy that I took care of. A document of time. This entry was posted in aurora, conway stewart, diamine, fountain pens, habana, inks, iroshizuku, lamy, Leuchtturm 1917, montblanc, paper, pens, pilot, Pilot M90, private reserve, rohrer & klingner, rotring, writing, yard o led and tagged aurora, clairefontaine, conway stewart, fountain pens, habana, ink, journal, lamy, Leuchtturm 1917, moleskine, notebook, paper, pens, quo vadis habana, review, reviews, rhodia, travel journal, writing, yard o led. Bookmark the permalink. Hi Lady dandelion! Thanks for the fantastic review, very helpful when someone is trying to buy a journal. I was thinking why no body send this kind of ink and paper review to the people of Leuchtturm. In order to help them in the improvement of the inkproof-paper quality. Du tar så fina bilder, varje gång! I have to agree about the improved quality of this notebook. Certainly not up to the level of Quo Vadis & the Webbie, but easily better than you-know-who in the bleed dept. I just took it with me on a recent weekend trip to the PNW, and it performed beautifully. This notebook does work best with a blotter sheet, but that’s hardly a deal-breaker.